Portsmouth manager Paul Cook has said he should be free to pick whatever team he likes after fielding six debutants in their defeat by Exeter. 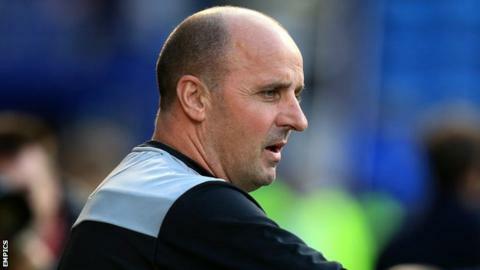 Pompey lost 2-0 in the Football League Trophy tie at St James Park, but Cook defended his choice of players. "If you look at our team selection in the League Cup, we made the same amount of changes," he told BBC Radio Solent. "As a club I think we should be allowed to pick exactly what team we deem is right for whatever competition." Adam Barton, Calvin Davies and Brandon Joseph-Buadi all started on Tuesday night, while Christian Oxlade-Chamberlain, Kaleem Haitham and Kal Naismith, came off the bench. But despite fielding a side with only three players aged over 20, Cook insisted he had taken the competition seriously. "We haven't disrespected any competitions, we've done our best in them all, and we go out in the competition in what I think is the right spirit," he added. "It was a perfect opportunity for our lads to showcase themselves and show how good they are. How do you get a football education without playing football?"